U.S. stocks advanced on Friday following a stronger-than-expected July payrolls report with non-farm jobs up 209,000 last month, topping economists’ consensus forecast by 29,000. The U.S. dollar strengthened as wage growth rose 0.3% (the largest increase in five months) and new manufacturing jobs exceeded projections. Separate data showed the headline unemployment rate declined to a 16-year low of 4.3% from 4.4% even as the labor force participation rate increased to 62.9% from 62.8%. The U-6 underemployment rate held steady at 8.6%. Meanwhile, second quarter earnings is over two-thirds complete with benchmark companies within the S&P 500 continuing to report earnings per share growth of over 10%. Wall Street investors also waded through heightened political risks after U.S. special Counsel Robert Mueller convened a federal grand jury to help collect information on his probe into Russian meddling into the 2016 elections. Through Friday, the Dow Industrials closed higher for nine straight days, its longest sustained rally since February, with the last eight sessions ending at all-time highs. For the week, the S&P 500 rose _0.23%, the Dow Industrials gained _1.20%, and the MSCI EAFE (developed international) increased +0.87%. Last Friday’s July employment report was a positive surprise, with non-farm payrolls rising by 209,000 last month. Despite an increase in the participation rate, the unemployment rate fell to 4.3%, matching the May 2017 reading as the lowest level seen in 16 years, as shown in Chart 1. The strength of the labor market should be welcomed by investors, as economic growth depends on both labor force and productivity growth. 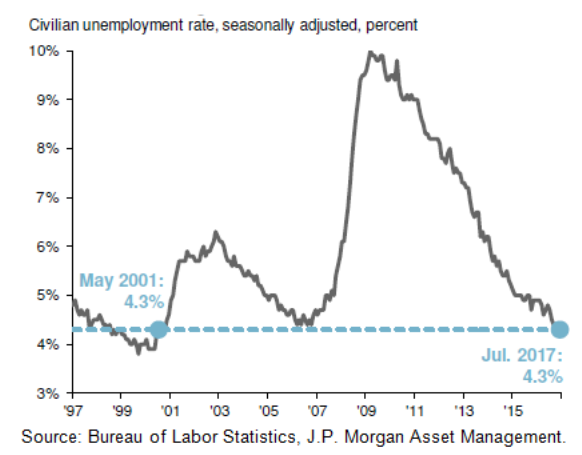 And while productivity growth remains subdued, the July employment report suggests that the labor market should provide support for moderate economic growth in the months ahead, according to J.P. Morgan. Additionally, there have been few signs of inflation despite continued labor market tightness, as both consumer and producer price data due out this week are likely to show inflation remaining in check. This should encourage the Fed to continue normalizing monetary policy gradually, likely commencing balance sheet reduction in October and hiking rates a third time in December. That said, the FOMC maintains that the process will be data-dependent. Nonetheless, J.P. Morgan believes this combination of moderate economic growth, low inflation and a tepid pace of policy change has created somewhat of a “Goldilocks scenario” for investors, and an attractive backdrop against which risk assets can continue to appreciate.